"I wish crochet had immediately solved all of my problems but of course it didn’t happen that way. What did happen was that crochet slowly became a positive replacement for some of my most destructive downtime." Do you think the title Crochet Saved My Life is absurd? 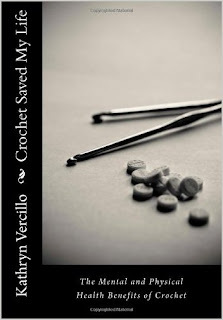 Kathryn Vercillo assures us that in a very real way, crochet played a crucial role in moving her through a period of deep depression. "Of course, crochet alone could never have taken me out of that desperate place. It is a craft, not a cure-­-all for serious illness. And yet I am also fairly certain that I could never have loosened myself from the grip of that depression without crochet. I was stuck in between that proverbial rock and a hard place and my crochet hook served as a crowbar to begin prying me out of that difficult space. I hardly knew that it was happening and yet that hook dug deep down into the core of my being and lifted me into a space where I could once again begin to breathe. 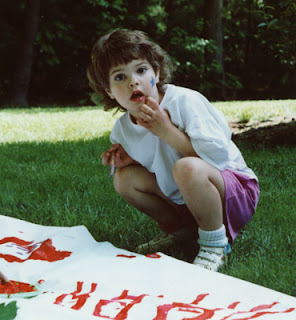 In the most basic and obvious way possible I was creating a life for myself simply through the act of creating." I'm going to simplify Kathyrn's message drastically here, and I hope that I don't do it a disservice: crochet can be a physical form of meditation, a gently repetitive and focused task that can help to take a person outside or herself and her interior trauma. And it results in the practitioner actually creating something, which is no small thing for someone who feels derailed in other ways. This is not a medical textbook, nor does Kathyrn share it in order to "prescribe" any specific regimine. What it is, is a story book. There are stories by 24 crafters, including the author. People who suffer with depression, anxiety, OCD and addiction, PTSD flashbacks, schizophrenia, bipolar, Alzheimer's and memory loss, pain, stress, mobility. These stories are interspersed with research on mental health and needle arts, how the practice of crochet can help break destructive cycles, release serotonin, build self-esteem, help ground a person in reality, give them a sense of continuity, and relieve anxiety and stress. There are also special tips for caregivers, one of the most under-appreciated groups of people who are stressed. Resources at end of the book include online communities, online crochet classes, crafting for health resources, crafting for charity groups, recommended reading, and all of Kathryn's scholarly research sources. Well, crochet has definitely brought me much needed creative distraction from the pain of my MS. Sounds like a worthwhile read. Thanks :). That's good to hear, Michelle. Physical challenges need a multi-pronged approach, and I'm glad that Kathryn decided to share about this journey. Your "simplification" of the book's message is spot on!! Yes! I would have thought it is the very act of creating something, whether you crochet, knit spin or do embroidery. Not to take anything away from Kathryn's experiences, embroidery, then spinning, brought me back from the edge when I was facing an all too brief future, and I still need to spin to keep balance in my life. Yes, I crochet too because I enjoy it and to keep the yarn mountain from growing. But I can spin lying down in bed, lol! I also do mixed media, sew, dye things, sketch, try to paint; they are all creative activities and thats the important bit. They look to the future. While we are creating we cannot be destructive. Crochet is one way of getting there. I like that view of it. I've always thought that the act of creating in some small way helps to hold off the darkness! I LOVE this thought from SpinningDownUnder: "While we are creating we cannot be destructive." I'm putting this book on my Wish List. Totally agree with SpinningDownUnder that there are definitely therapeutic experiences in almost all creative hands-on crafts, which is something I mention in the book. The book is told through the lens of crochet stories because that's my craft. And there are certain specific benefits of crochet that I'm not sure apply to all crafts equally but of course each craft has its own benefits. I just recently got my first drop spindle and am planning to try spinning soon as well!